When I took the bus to school in high school, I had to pass through the Yonge/Eglinton Subway station. Inside was a Cinnabon. For those of you who live outside the 30 countries where thay are now located, or managed to avoid shopping malls your whole life (and for that I would envy you), Cinnabon is the sweetest smelling cinnamon bun bakery there ever was. They are steamy hot, oooey, gooey, chewy and dripping in the sweetest icing. And passing through the building, smelling these at 3:30pm on a daily basis was torture. To my cravings and to my bum size. According to online sources, one Cinnabon contains 800 calories. Now, you're probably looking at that total fat and thinking nasty thoughts at those smart Cinnabon people for blowing the sweet cinnamon and sugar air at you as you walk by. But check the cals from carbohydrates. Notice also that only 2 grams come from dietary fibre. That means that there are at least 125 grams of sugar in each bun (in the form of straight up sugar, or the disguised kind in the form of white flour). Now, I did also look into the ingredients and I thought I'd let you know that the fat in those, comes from margarine- partially hydrogenated (and totally GMO) soybean and cottonseed oil. I also discovered at least 8 different types of sugar. Needless to say, the smell has long since become nauseating and I have long since been searching for something much, much better. And then there are mine. Not quite as oogey, gooey and chewy, but also not as toxic. My goal for these buns, were for them to be gluten and yeast free. They also had to be free of any other garbage vegan ingredients like vegan-margarine, shortening, or anything else made with a suspect cocktail of toxic oils. Of course, I also wanted them to be made with unprocessed flours, unprocessed sweetener and a bonus would be a recipe that would also make my vegan lovers happy. This amazing recipe from on of my fave recipe blogs, Whole Life Nutrition Kitchen, served as the inspiration. I ground the flour myself, so this is seriously made from scratch. 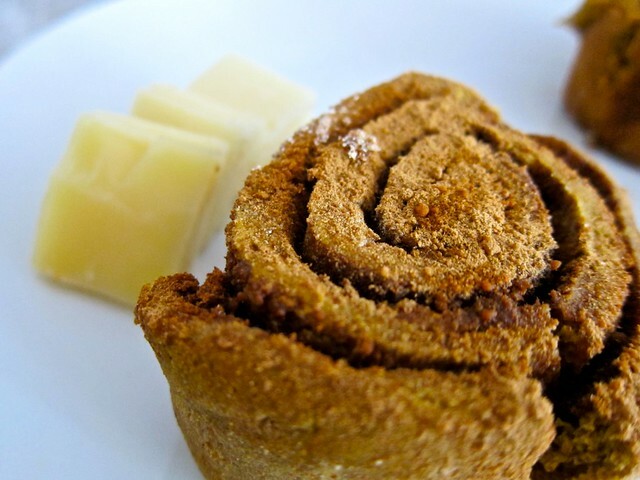 These fibre rich, just sweet enough, whole food based cinnamon buns are amazing. Really, very, very amazing. You might be the type to go for icing, but I go for some organic butter or a few slices of sheep cheese. Now what is the calorie count for these gems? I haven't a clue and don't care. They are whole, unprocessed, made with quality ingredients, including good oils. As long as you don't go eating the full tray full at once, I promise you have nothing to worry about. Question Of The Day: What is your favourite childhood dessert that's you've since upgraded for health/taste/wholeness or just cause? ps. If you're looking for more sweet treat inspiration, check out my Sweet Tooth Healthy Treats Class. And if you want help with your bread baking adventures, we've got Get Baked: Gluten-Free Style. pps. One week today, I'll be presenting to the University of Toronto Medical School. A few spots are still available for the public. Get details here to RSVP. 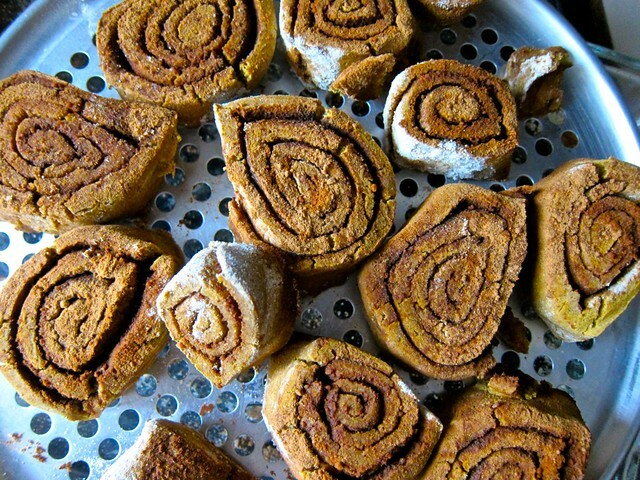 I am a huge cinnamon bun lover and I cant wait to make them. Is there something I can sub for coconut crystals? I can't find them in Ottawa. Thanks!!! 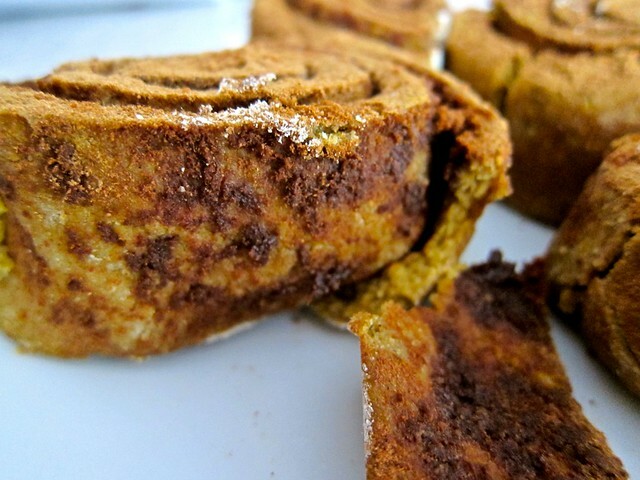 Did you figure out the nutrition facts for your cinnamon rolls? I tried out the recipe, but the dough turned out much too wet to roll out, so I felt like I had to keep adding heaps & heaps of flour. Any tricks for rolling out dough when it's so sticky? I'm still trying to get the hang of using gluten free flours. Place it between two sheets of parchment paper and toll it that way.